Saving lives and property demands the best in personnel and gear. And that is just what the AMF Boat Company has delivered with an all-new De Villiers-designed QRV 900 jet-powered rescue rib, writes Steve Raea. Anyone that has been around trailer boats for longer than a wet weekend will recognise the brand AMF. And deservedly so. Established in 1984, the company is now the longest running in New Zealand under original ownership. Regarded as premiere builders of custom alloy boats, owner and builder Paul Sharratt has built boats for almost every purpose, be it tourism, adventure, pleasure or commercial. It should come as little surprise, therefore, to learn that the latest proto-type alloy rescue craft is badged AMF. 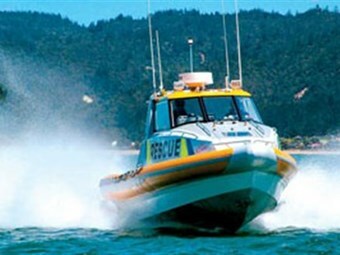 Commissioned by the Tairua-Pauanui Coastguard, the QRV 900 RIB (Quick Response Vessel) is a diesel-powered jet boat designed to operate in surf and shoal conditions common to the Coromandel Peninsula. But more so, it is a boat designed to operate in any weather while keeping crew fatigue to a minimum. And this has principally been achieved in two ways – faster response times and built-in comforts aboard. With its canary-yellow pontoons and hardtop, the QRV 900 looks at odds with Coastguard's fleet of rescue-orange Naiad and Rayglass vessels and for this reason alone the new boat has not yet been officially stamped "Coastguard". But these are minor "political sensitivities" and are being worked through with Coastguard's top brass. 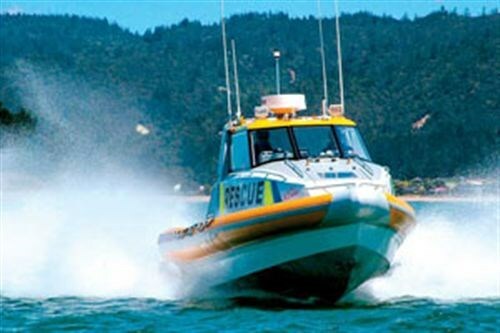 The QRV project came to life nearly two years ago when the Tairua-Pauanui Coastguard began evaluating new rescue vessels to replace its ageing 350 Chev-powered Ramco-jet. Tairua-Pauanui Coastguard project co-ordinator and rescue skipper Steve Taylor says the Ramco served with distinction but changing operational requirements demanded a bigger boat with more range. "There was a time when the majority of our work was pulling swimmers out of the surf or rescuing small craft close inshore. Increasingly, our work load involves larger vessels considerably further out to sea. We had limited range with the Ramco and it could be bloody miserable in any sort of weather." With the decision made to replace, members started evaluating suitable craft. The obvious candidates were Naiad and Rayglass. Both brands are well-proven in rescue services and carry financial incentives. "It was financially a better option but we felt it was a compromise," says Steve. "We evaluated both boats but weren't comfortable with either. Our operating area has its own unique conditions and we decided to go it alone and commission our own boat." With community funding partially in place Steve Taylor and colleagues approached AMF's Paul Sharratt and together they worked through some basic design principals. "We were clear on a few things, says Steve. "We wanted a boat about nine metres overall, a good operating range, jet-powered and with a target speed of about 40 knots. We also wanted a boat that could operate in surf conditions and something that would keep crew fatigue to a minimum." 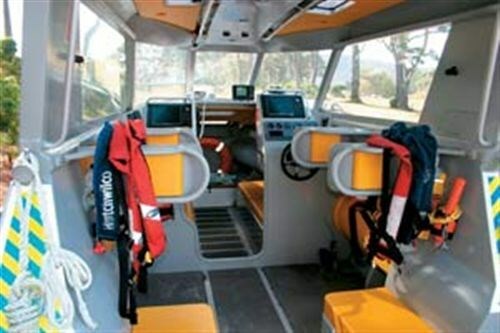 AMF in turn commissioned West Auckland's De Villiers Design to prepare a design in keeping with Coastguard's primary objectives - speed, comfort and versatility. Construction began 18 months ago at AMF's Te Puke plant and the QRV 900 was launched in late September. Steve Taylor says the boat has exceeded Coastguard's expectations in every way and has more than justified the additional expense and complications that members had to live with as a result of going it alone. De Villiers Design describe its hull form as "reasonably standard" with a moderate 18 degree deadrise and an easy-riding entry. The boat's 2.36m waterline beam has been kept to a minimum to lower overall resistance whilst providing adequate deck working space. Power is from a single 440 horsepower Yanmar diesel coupled to a Hamilton 274 jet unit. De Villiers say that unlike conventional rigid-hulled inflatables, the design paid particular attention to keeping the collar or flotation tubes out of the water to reduce drag, enhance fuel economy and lessen maintenance requirements. The collar is not required for stability and rides clear of the surface at all speeds. In operational terms, the collar serves only as a fender when coming alongside other vessels and to assist crew when pulling swimmers out of the water. While this is true, it is worth noting that the 550mm Hypalon tubes provide three-tonnes of buoyancy should it ever be required in the event of a catastrophic failure or capsize. Construction is typical AMF quality with a CAD build-system and plasma cutting of the major alloy components. The cabin top is custom-built with large radius alloy work giving the boat a sculptured look. The hull and topsides are built from 6mm marine-grade alloy and the deck from 4mm plate. The hard top is fitted with an 8mm armourglass windscreen and 6mm side windows, completing a package that is bullet-proof in anyone's language. 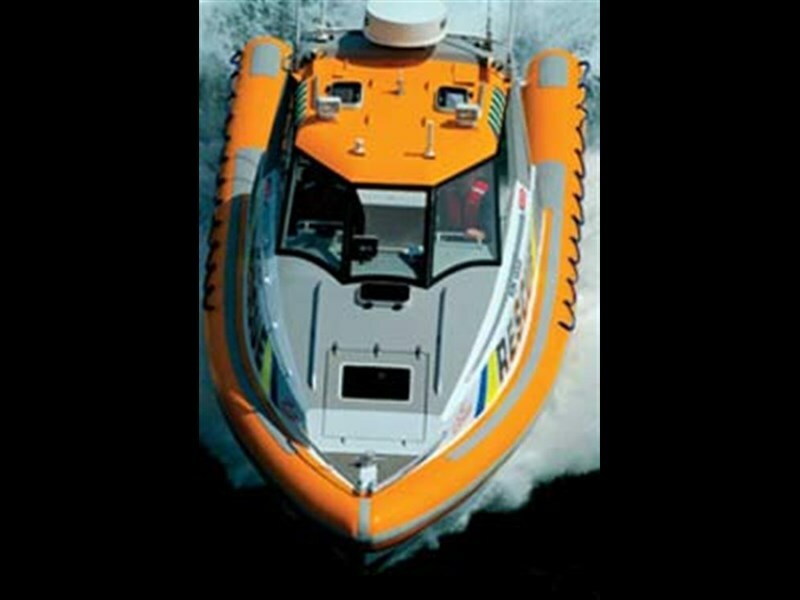 The hardtop and cabin configuration have been designed to facilitate rescues at sea with a large custom-built deck hatch in the bow and a wide internal companionway to allow stretchers to be carried through the boat. When not used for stretchers, the cabin provides sitting headroom and seating for six passengers with storage under. The hardtop has been designed for four rescue crew with twin standing bolster units each side of the companionway. These are fitted with padded backrests and strategically-placed handholds. The floor beneath these units is padded to take much of the jarring out of the ride in rough conditions. The hardtop ceiling carries additional hand supports either side of night spots and directional navigation lights for driver and navigator. All-round visibility is excellent and twin overhead Weaver deck hatches ensure good ventilation. The QRV's cockpit is dominated by the sealed engine hatch. This sits amidships and hinges forward on gas struts to give easy access to the Yanmar's oil and diesel filters. Aft of the engine box is a large towing post built into the backbone of the boat. The cockpit sole, cabintop and top of the pontoons are fitted with 3mm deck tread providing a sure footing during rescues and a secure passage to the bow should it be required. The cockpit is completely self-draining and fitted with twin AMF passive scuppers. Should water find its way to the engine room it is returned overboard via a 2000 GPH bilge pump fitted with an automatic float switch and alarm. Two quarter seats are fitted at the aft end of the hardtop and add to the vessel's stowage options. A full-length boarding platform with raised cutaway over the jet unit completes the aft profile. Given the work ethic behind the QRV 900, the designer and builder have put a lot of thought into passenger comfort and this could pay dividends further down the track. De Villiers believe they have a platform that could be adapted for more general commercial duties like high-speed piloting and crew transfer vessels. The helmstation and navigation suite is extensive and designed to operate on simultaneous displays on the passenger side. This allows the driver to concentrate on driving and the navigator to operate the instruments. The helm station is simply laid out with the wheel mounted flat against the forward bulkhead with the engine gauges above. The nav station bristles with the latest Simrad CX 44 10-inch plotter/radar strategically placed below the driver's line of sight. A Simrad DS 44 dual function display is mounted on the passenger side. 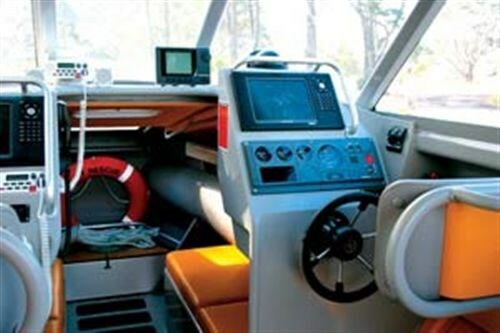 An Interphase Advantage echo sounder is mounted amidships and dual VHF radios are mounted on both the driver and passenger sides. Cellular telephone, twin spot lights, power conditioner and spike protector complete the list of electronics. Initial testing of the QRV 900 has shown the boat to exceed its target performance with a top speed of 44 knots and a fast cruise of 33 knots which can be maintained in all but the roughest conditions. The Yanmar 6LY2M –STP marine diesel is close-fitted to a Hamilton 274 jet unit via a twin Hardy Spicer commercially-rated coupling with short drive shaft. The jet block has been faired and welded into the hull. Water for the jet is taken off the hull via a strainer and exhausted through a fabricated muffler box amidships of the transom. Air is force-fed to the Yanmar via large internal air ducts led from a pair of Seaworth air-water separators. This set-up allows the engine to continue operating even if partially submerged. The engineering and set-up is first class and what you would expect from a commercially-rated rescue craft. All systems have been designed for ease of maintenance and long service life. Those that have experienced powerful jets will know that nothing quite matches the exhilaration of planting boot and watching the torrent of white water shoot out the back with the force of a fire hydrant. While the big diesel might not have the instant acceleration of similar-sized petrol V8s, it is no slouch either, reaching its 33-knot cruising speed in no time at all. Once more it does it without the deafening howl of petrol engines or the slap and gurgle common to large inflatables. The QRV 900 drives and handles much like a standard alloy hardtop once you become familiarised with the softer steering control of the bucket. The boat has excellent directional stability with a roll centre 28mm above the wet deck and enough beam to keep it stable at low revs and idle. Fast cornering, jet-spins and reverse-bucket stops are the traditional fare of jet-tourism operators but the QRV 900 can match it with the best. Driver and passenger comfort is similar to what you would expect from a nine-metre hardtop but engine noise is down. And while our afternoon presented less than challenging conditions, subsequent sea trials in offshore surf and rough seas have proved the boat to be capable and predictable. Steve Taylor says the boat has exceeded all expectations thus far and has attracted a lot of interest from other Coastguard operators. While still officially under evaluation, the QRV 900 is increasingly being put into active service and will become a familiar sight around the Coromandel Peninsula over the summer months. Meanwhile Coastguard's faithful Ramco-jet is expected to go into rescue service elsewhere to free-up shed space for her replacement.